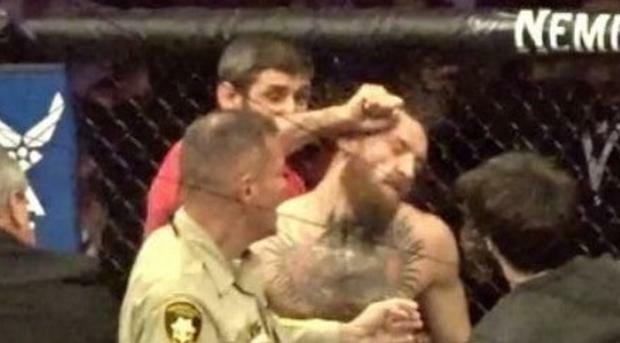 A UFC showdown between Conor McGregor and Khabib Nurmagomedov's team-mates has been cancelled in the wake of the UFC 229 post-fight brawl. Nurmagomedov defeated McGregor last weekend via submission, to defend his lightweight title and preserve his perfect professional record. However his victory was quickly overshadowed by a post-fight brawl, which saw Nurmagomedov vault over the Octagon to attack McGregor's corner, while the Irishman fought with Zubaira Tukhugov. Nurmagomedov team member Tukhugov had originally been scheduled to fight Artem Lobov on 27 October, but that fight has now been cancelled. Lobov's management first confirmed the cancellation. "The fight is cancelled due to the riots at UFC 229," they told Russian news agency TASS. "Artem will get a new opponent." Moments later, Nurmagomedov himself appeared to confirm the news in a lengthy Instagram post. The Russian promised to quit the UFC if Tukhugov was thrown out of the UFC – as promised by president Dana White immediately after the brawl. "I would like to address the UFC," Nurmagomedov wrote on Insatagram.